It is now a few years that one of the UK’s leading weekly architectural magazines, Building Design, seized its print production and moved all its contents online and yet, at the point of its potential disappearance, we know little about the beginnings of the printed architectural magazine. To explore early magazines and their origins, Anne Hultzsch will host a session at next year’s EAHN conference in Tallinn (June 2018). Surfacing as a genre from a widespread publishing frenzy in the first half of the 19th century, simultaneously in many countries, imitated and reinterpreted elsewhere later on, and re-launched as and when technological changes appeared, the architectural magazine is one of the most important material manifestations of architectural cultures besides the building itself. Its status as an, often but not always heavily illustrated, serial with weekly, monthly or quarterly publication means it is placed as no other medium to capture the Zeitgeist of building, mapping architecture’s stakeholders, whether professional, academic or lay. While scholars have in the last few decades increasingly turned to investigate 1960s and 1970s architectural journalism, the nineteenth century has received surprisingly little attention, a curious paradox. Aiming to close this gap, this session invites contributions that explore the genre of the architectural magazine by examining its editorial formation at any point during the long 19th century, including the last and first decades of the 18th and 20th centuries, respectively. This moment of formation can be interpreted to have taken place at different times in different places, and shifts in the genre will have led to the reformulation of its characteristics. It is these moments of defining what it meant to conceive, write, illustrate, edit, print, distribute or read a magazine for architecture, which this session will target. Particularly welcome are also contributions that focus on lesser known titles or countries in which the genre emerged later than in others. Papers should explore themes around the producers, audiences, distribution, economics, technologies, appearance or geographies (both micro and macro) of the architectural magazine. 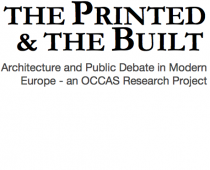 Questions discussed could include: what constitutes architectural news, in text and image? How did the architectural magazine differ from, or overlap with, other forms of serial publication, both special and general-interest? What role did debate and exchange play, and what was the ensuing relationship between professionals and the public, or between professionals and critics? These and other issues will help to explore and define the crucial part that architecture, and its discourse, played in the public realm of the 19th century. Find the call for this session here, and see the conference website for all further details.